So…for the past 3 days I have been on a juice cleanse. Juice and only juice for 3 days! I felt like I needed a fresh start and help with curbing some of my bad cravings. I had done a juice cleanse in the past through Ritual Cleanse in Newport Beach, CA and I was really happy with how I felt after I was done. This time I did it on my own (MUCH cheaper) with the help of Organic Tree in Dana Point, CA. Organic Tree is a juice bar that uses a top of the line juice press for all of their fabulous organic veggies and fruits. I got all of my green juice from them for each day (kale, spinach, celery, cucumber and parsley…3 times a day!). I also did some juicing at home to complete my 6 a day. One is a very yummy blend of carrot and pineapple! At the end of the day you get a “smoothie” made with alkaline water, cashews, dates, vanilla & cinnamon. Did that one in my Vitamix and it pretty much saves you from total starvation! Anyway, I feel really good and want to keep up the good habits so for my first real dinner I thought this salad would be a good start. I also get to have coffee and wine again…THANK THE LORD! I got the idea for this recipe from a link that my friend Lori shared with me for a very similar salad from a another food blogger. It looked delicious so I adapted it to what I had at home and needed to use up. 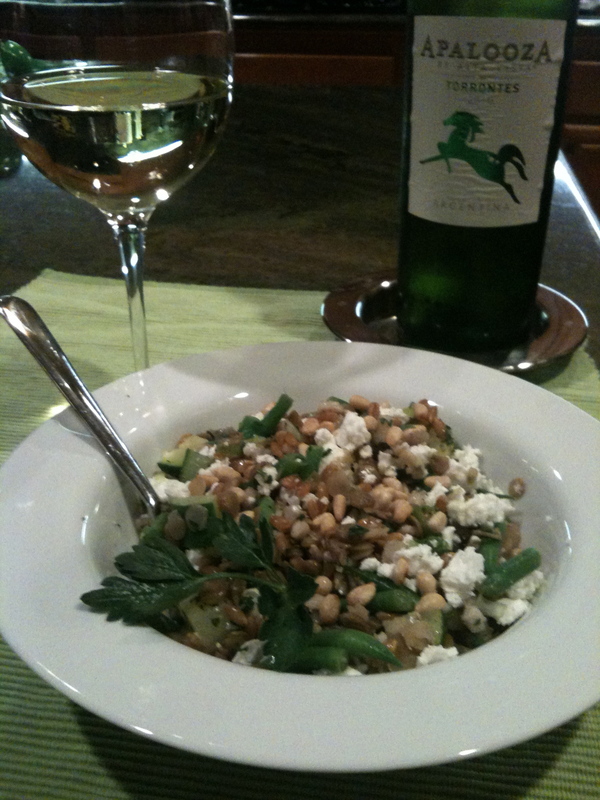 Here is the link to the original recipe if you want to check it out: http://www.kalynskitchen.com/2012/03/recipe-for-lentil-and-barley-greek.html. She used tomatoes in her salad which would be really yummy IF tomatoes were in season. I will try it again that way when our garden tomatoes start coming in. You could vary the ingredients quite a bit to suit your taste. I used farro instead of barley. 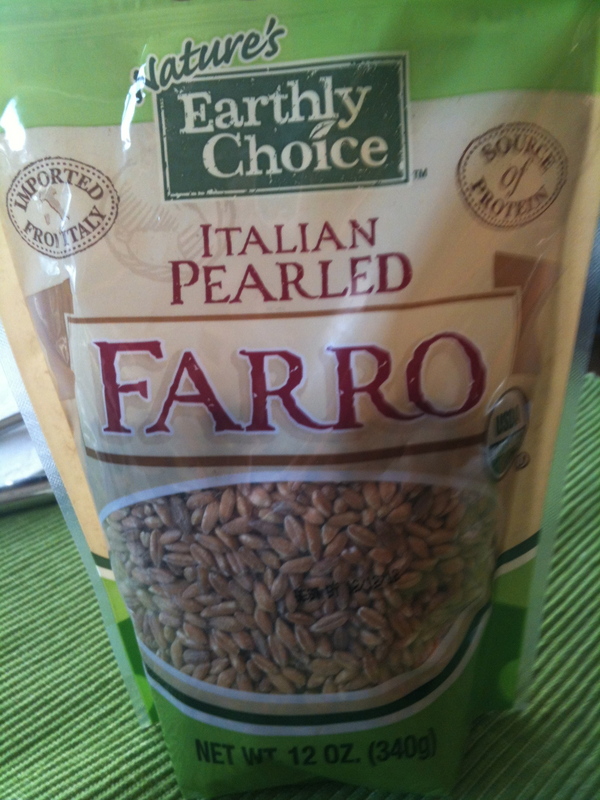 I LOVE farro and it’s chewy texture. It is an Italian grain that is very similar to emmer wheat (sort of like a wheat berry). It can be hard to find but I have found it at places like Whole Foods and it is sold at Williams-Sonoma. 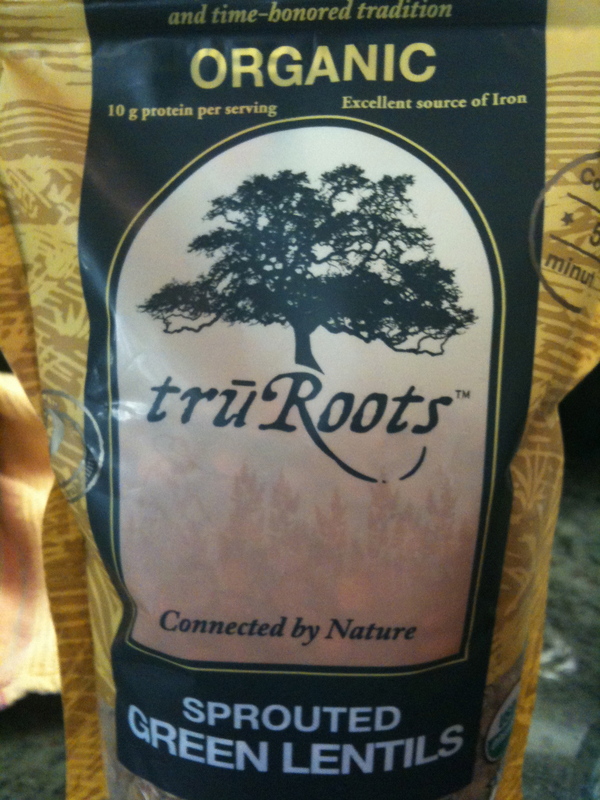 For the lentils I used a quick cooking “sprouted lentil” from True Roots. They cooked in a very short time and I recently read that “sprouted” lentils are even better for you than the regular ones. Any type of lentil would be great though. You need to cook the grains and lentils separately because of their different cooking times and you can do it ahead of time then pop them in the fridge until you are ready to put the salad together. 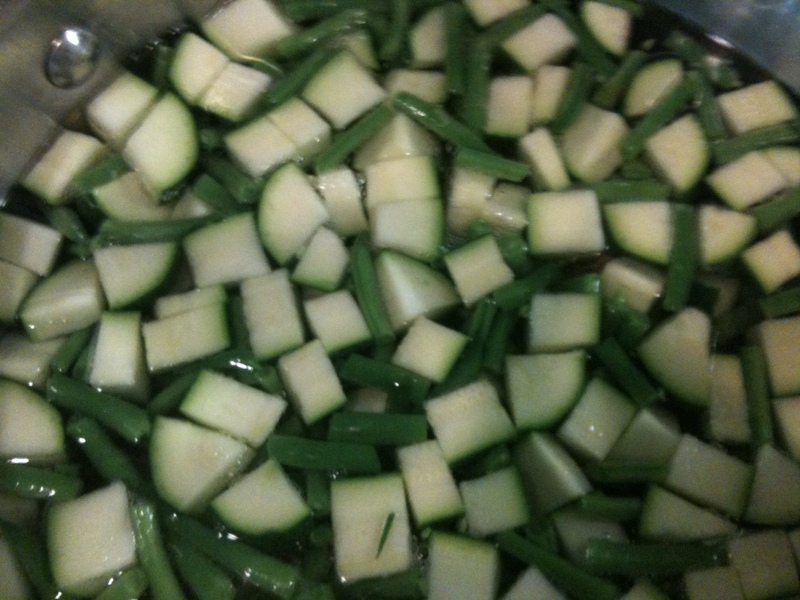 As for the rest of the ingredients, I used what was in the fridge: a bag of french green beans and a couple of zucchinis that needed to get used. I blanched them – put them in boiling water for just a few minutes then put them in an ice bath to “shock” them and help them keep their nice green color. It’s important to keep a close eye when you blanch veggies…you want to keep that nice crisp bite and it only takes a minute or two to get them there. I thought green onions would give some good flavor and some Italian parsley (which I pretty much put in everything!). I picked up a really good feta cheese at the market. An imported sheep’s milk feta…much tastier than the domestic stuff! Remember…simple food needs really good ingredients! I feel like the better it is, the less I have to use. 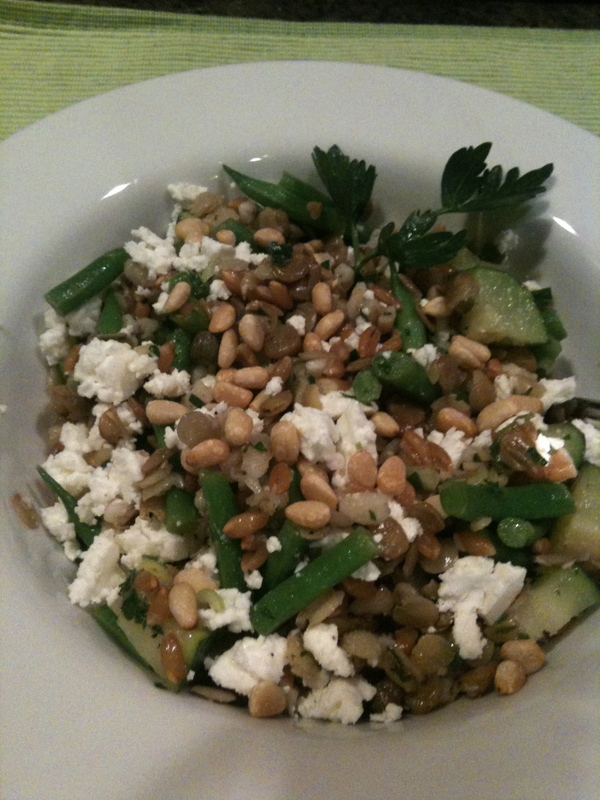 Combine all of the salad ingredients except the pine nuts and mix well. Whisk the dressing ingredients well and mix into the salad. Serve with the toasted pine nuts on top. My family had this salad for dinner with steamed artichokes (my kids favorite!). The left-overs were really yummy the next day for lunch!